Snarling Dragon Fantasy Axe | BUDK.com - Knives & Swords At The Lowest Prices! This highly detailed fantasy axe is the piece that will turn heads. 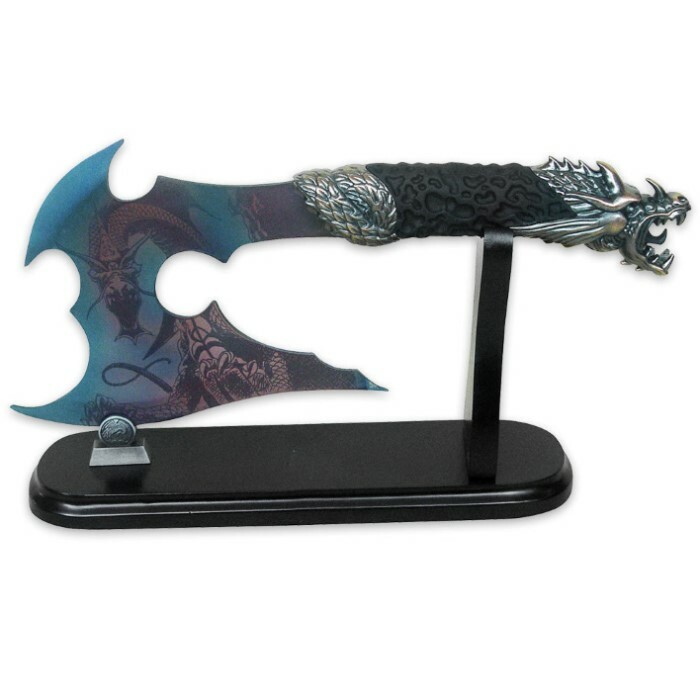 The fierce axe head is constructed of stainless steel with a full color dragon design right on the blade. The handle features a scaled dragon neck with the dragon's head as the pommel. Includes a wooden display stand. Wow... this is the best piece I've ever bought from weapon retailers. It is sharp, sturdy, and a great decor piece. No flaws for this weapon of pure destruction! Awesome!! Not as sharp as my last item I bought off here but its great! I love the look and feel. Blade is firmly in place! Now to add it to my collection of other various weapons. Wish a lot of the weapons I want would.ship to ny!! This axe is phenomenal. This is by far THE sharpest thing I have ever purchased from this site, I would not advise letting youngsters or rambunctious people around this beast. I can't find anything in this axe that I can complain about. It is easily the most beautiful piece in my collection, the blade design is just amazing! I can't say enough good things about this product! I got it was very excited later that evning was wingin it around and slashed open the back of my arm! Little bugger is sharper than hell!